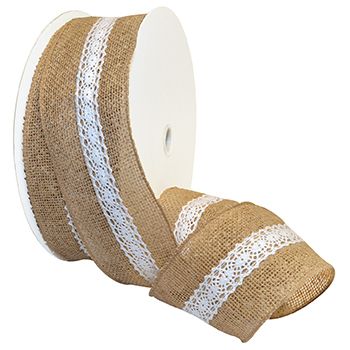 A high-trend item, Burlap and Lace ribbon is wired burlap ribbon with a center strip of cotton lace. This ribbon is absolutely perfect for rustic weddings, holiday decorating, gift wrapping, crafting and more. Highly structured for perfect bows every time. Pair with some of our Swiss double face satin and some mason jars for a look that is a step above!